Saint Tirunavukkarasar had sung the glory of the Lord of the temple in a metre that runs fast with such melody suiting to the dancing skill of the Lord as the very name Nardana Pureeswarar-Aada Vallar suggests. “He is penance Himself, He is the Veda and its seed, wearing the crescent moon. 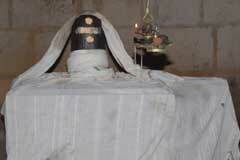 He always retrieve me from sufferings, hiding the Ganga in head and has Mother Uma as His part, He is all philosophy. I have wasted and lost all the days being away from Him. 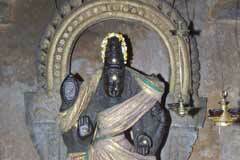 That Lord is in Thalayalangadu.” This is the 93rd Shiva temple on the southern bank of Cauvery praised in hymns. Thai New Moon day in January-February; Masi Shivrathri in February-March and Aipasi Annabishekam in October-November are the festivals celebrated in the temple. Lord in the temple is a swayambumurthi. 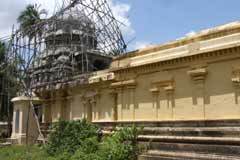 The temple is open from 8.00 a.m. to 12.00 a.m. and from 6.00 a.m. and 8.00 p.m.
Sri Nardana Pureeswarar Temple, Thalayalangadu-612 603, Chimizhi Post, Via Sembangudi, Kudavasal Taluk, Tiruvarur district. +91- 4366 - 269 235, +91- 94435 00235. 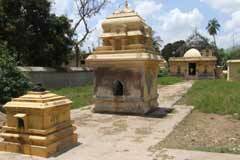 People pray here for cure from serious skin diseases as leprosy and for child boon. They bathe in the sacred spring and pray to Lord and Mother. Devotees perform abishek, special pujas and offer vastras to Lord and Mother. 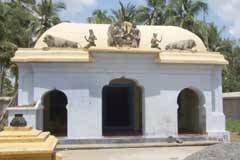 Theertham is sittuated in front of the temple. After take bath from the theertham and lighting lamp for lord will cure the skin disease. The wicked sages in Tharukavanam performed a yajna and created a wild elephant to destroy Lord Shiva. Lord simply stripped the skin of the animal and used it as a blanket. He held a deer in His hand. Destroyed a demon, Muyalagan by name and danced on his body in this place. 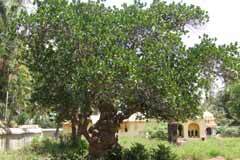 Sage Kabila worshipped Lord in this place. 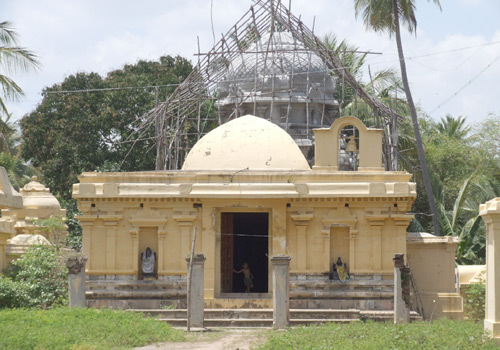 This is also a place of importance in Tamil political history. Pandya king Nedunchezhian defeated the other Tamil kings and was honoured as Thalayalanganathu Cheru (war) Vendra (conquered) Nedunchezhian – Conqueror of Thalayalanganam. Devotees believe that their prayer to Lord in the temple would cure them of leprosy and also bless them with a child. 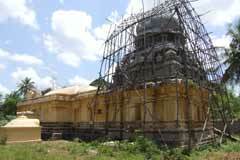 Thalayalangadu is 15 km far from Tiruvarur on the Kumbakonam route.